Welcome to the Overclockaholics Forums. 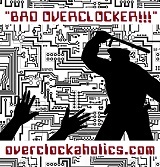 Want to Join the Overclockaholics Community? Most users ever online was 1,759, 11-15-2018 at 09:18 AM. All times are GMT -10. The time now is 08:32 AM.